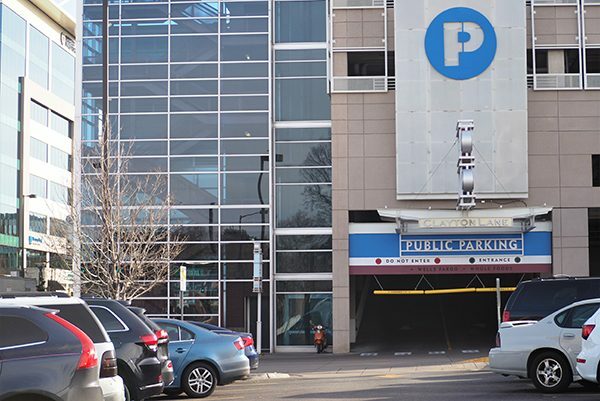 The city of Denver is poised to unload its share of a parking garage in Cherry Creek. The city has reached an agreement to sell 198 spaces it owns on the upper two levels of the garage accessed from 2nd Avenue for $6 million to Clayton Lane Investors LLC. Clayton Lane Investors, a partnership between OliverMcMillan and Invesco Real Estate, owns the rest of the garage, and much of the property between 1st and 2nd avenues from Josephine Street to Detroit Street. Its holdings include the building used by Whole Foods and the former Sears store, which has been vacant since 2015. Jeff Steinberg, Denver’s director of real estate, briefed City Council’s Finance and Governance Committee on the proposed sale of the parking spaces last week. The sale ultimately needs to be approved by a majority vote of the full council. Steinberg told the committee that the garage is set to be demolished as part of Clayton Lane Investors’ upcoming redevelopment of the site, and that the entity needs to buy back portions of the site that it does not own. Steinberg said he expects the structure will remain standing for at least a year after the sale of the parking spaces closes. “There is no current plan to demolish the structure,” said spokeswoman Hilarie Portell, adding the company has not finalized its redevelopment plans or timeline. “This (transaction) is not any kind of triggering event for redevelopment of the site,” Portell said. The city purchased the parking spaces in March 2003 for $4.7 million in an effort to combat a parking challenge at the time. The city tapped the Cherry Creek North Business Improvement District to administer leasing of the spaces, charging at first $50 a month, and later $75. Demand for the spaces ultimately didn’t match expectations, Steinberg said. Steinberg said the spaces recently were appraised at $4.5 million, but that the city was able to negotiate up to $6 million. Property elsewhere in Cherry Creek has skyrocketed in value in the last 16 years. Steinberg said the city’s holdings didn’t do so because the spaces accounted for only a portion of the garage, and the original purchase agreement stated that the city could sell the spaces only to other part-owners of the garage. Steinberg said that, after the transaction closes, Clayton Lane Investors will continue allowing monthly parking for local employees, and Portell confirmed that plan.